Text segments, not necessarily a full paragraph, but it could be, open with a totally different background color after the original document (in .odt format) was saved as a Word 97-2003 (.doc) document. In my case, I used color "Blue gray" for the initial highlight color. When I opened the new document, the background color came up as "Blue 3". To do the formatting, I used the "Highlight Color" toolbar button to set the background color of the first segment, then the "Clone Formatting" button to "paint" additional text with the selected color. I saved the document to the Word 97 format. When opened, the new Word 97 document had a different color (Blue 3) for all highlighted segments. This thing happens because MS highlighting has only 15 highlighting color and when you save Writer text background \ highlighting to an MS format it is converted to this color palette. Before the 5.0 version sometimes we saved Writer text background as shading (doc, docx), sometimes as highlighting (rtf). From that version an option is added, so the user can select the preferred behavior. Highlighting became the default, because on LO UI text background is called highlighting. This option can be set also via user profile. So, probably not a bug.. It's might be better to switch the setting the other way around -> saving the highlighting as MS Shading. *It will break the experience of MS Word users wanting to edit a file.. Switching to the save mode makes sense. Guess most users don't know the difference. Alternatively, we could ask the user when exporting a document may result in corrupt properties. Microsoft only allows 15 colors to be used as highlight colors in both .doc and .docx, so this is a format limitation bug that isnt ours. > *It will break the experience of MS Word users wanting to edit a file..
Users being able to modify the highlighting is the most important thing, so i'd stick with this by default. We already give users the 'Confirm File Format' dialog when not saving to ODF, which does state 'This document may contain formatting or content that cannot be saved in the currently selected file format'. 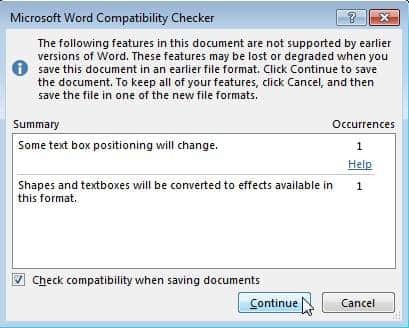 We could go beyond this, if devs are interested in implementing it, and create a dialog similar to the MS compatibility checker. > to the MS compatibility checker. This would be really genius to have a list of things that change instead of a vague statement that something could happen--or not. In such a dialog also the possibilities in the options dialog can be referenced because nobody finds the option to change highlighting saving today. Removing UX as input has been given. QA: Is it still a minor issue? I will highlight a passage with "Blue 1" for a Writer .docx format. I will save it, and close Writer, and then I open it again, and the highlighted passage will now be "Blue 3". I tried it with another colour and I chose "Cyan 8" this time, and I saved it, and opened it up again, and this time it was #008080. Since this is the result of a MSO limitatin (see comment 2), the discussion in cemments 3 - 6 is about how to deal with such limitations. So my question is: Should we close this bug (and open a new one with the mor general topic of comment 3-6) or rename the bug summary? > Should we close this bug or rename the bug summary? Either way we have to come to a conclusion. I like the way it's done by MSO (see c5) - but it's a question to devs. So needsDevAdvice. Heiko, I think we should close this as duplicate of bug 104822. Do you agree? + some merit to this. + perhaps for big features works, but micro-level tricky. + PDF export has something like this too. I suggest to resolve this request as WONTFIX. The link to compatibility setting is not a big deal though also not really helpful. But I wouldn't make it a duplicate. > I suggest to resolve this request as WONTFIX. Additional suggestion: Perhaps it is possible to collect incomtable features in a wiki-page or something like that and add a link to that page in the warning-message. I'm afraid such a page is not really accessible. It might be good for odt vs. doc (would be a nice comparison sheet, btw) but if you save as rtf, txt or whatever almost every feature is not existent. Adding Italo since the format comparison was always his topic. The idea is to have a (large) sheet with supported features that gives an overview of the interoperabilty (wouldnt be surprised if we have something like this). > > > corrupt properties. > > to the MS compatibility checker. > a vague statement that something could happen--or not. I've confirmed that this issue is due to the .doc and .docx file format that I've saved my files in because when I saved the file in .odt there's no problem with the colour changes. I only really saved my documents in the .docx format for university, so I don't have a need to use that format now, so I'll be using .odt from now on. If a user changes the save as format to be .doc or .docx, rather than just give a dialogue that there could be some incompatibility in saving it to that specific format, is it possible to actually block out the extended colours that are available for the .odt format? So, in this instance, I've set my default save format to be .docx, and so LibreOffice will only show the colours that the MSO will allow, and thereby preventing me from choosing other colours that will just change back to the default MSO colours. The program is already doing this once I use the .docx format, so would it be too difficult to block off everything that isn't MSO for the colour palette? And if this is possible, then perhaps the program could go into a "MSO Compatibility Mode" and even show it somewhere on the program, where everything would change to be compatible with MSO and block off options that work with .odt, but won't in MSO's formats, so that user, especially inexperienced users, won't have to even worry about incompatibility? I should point out that even with different versions of MSO there are colour palette issues, so it's not just with LO, but within MSO itself. This is one of the reasons I've been MSO free for years. Thanks for putting out a fantastic office suite! to 104822 as a META-issue. You may want to ask on users@ or QA@ lists?